Gorgeous. 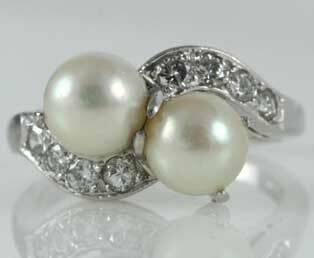 This estate toi et moi pearl crossover ring is stunning. Two luxurious pearls are gracefully mounted at a diagonal angle in the center of this platinum mounting. These two pearls are comparable in size, a light beige pearl brilliantly compliments the beauty of the faint grey pearl. A feminine ribbon of radiant diamond adorned platinum swirls among the pearls. This flowing ribbon flows above and below the pearls in a crossover design. This ring was crafted during the Art Deco Jewelry Period of the 1920s. Translated from French to English to "Toi et Moi" means "you and me". Toi et Moi rings are romantically designed to symbolize the love of two people.